Food Costs > How Much Do Clams Cost? How Much Do Clams Cost? Clams come in two varieties: a soft shell and a hard shell. The hard-shell clams are found on the East Coast and will come in three sizes, while the soft-shell clams have a thin and brittle shell that can’t completely close. Depending on the geographical area, clams may be available year around. The price of fresh clams will depend on the type, the amount purchased, the time of year, where it’s being purchased from and where you live. With these price factors in mind, the costs can be as little as $3 per pound if purchased at a local fish market to as much as $20 per pound for a clean batch ready to cook. At a grocery store, you will more than likely find farm-raised littleneck clams, which come in a 50-count bag. These bags, again depending on the market conditions, will often cost about $11 to $14. Wegmans, for instance, sells a 50-count bag for about $13. Canned chopped clams, depending on the brand, can cost about $1.50 to $3.25 per 6.5-ounce can. Bumble Bee, a popular brand, sells for about $1.50 to $2 per can. Shellstock, which means both shells will be intact, will be a clam in its whole form and won’t be processed in any way. A shellstock clam will either be sold fresh or frozen. This form is commonly consumed raw, steamed or added to a recipe. A half shell, as the name notes, is when the top shell is removed, and can, just like a shellstock, be fresh or frozen. The shuckled form will have both shells removed, providing the meat without any work on your part. It can then be chopped, stripped, steaked and can either be fresh, frozen, canned or even breaded. You may have to pay for extra shipping, especially if you don’t meet the merchant’s minimum spending requirement. Due to the sensitivity, special ice packs will be required to keep the clams cool during their transit, and most online retailers will only ship overnight. Don’t be surprised if the shipping fees inch close to $20 to $35. A clam shucking knife is ideal for those who have to open a large number of clams for a meal. 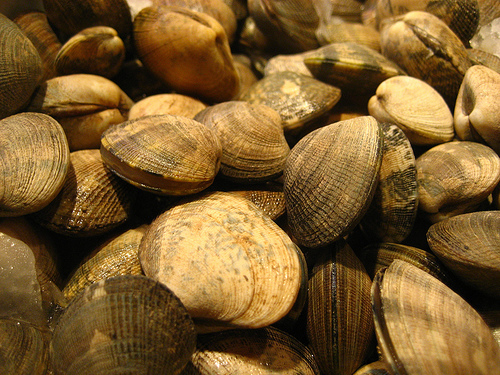 The largest sized clams are called chowders, followed by cherrystones, topnecks, middlenecks, and littlenecks, which are the smallest, according to Seafood Health Facts. These sizes will vary from region to region. Clams can be purchased at a local seafood market if you live near the ocean, online via reputable retailers, at local grocery stores, often found at the seafood counter and/or at seafood specialty markets. Whole Foods, for example, allows you to order your seafood three to four days in advance. Before purchasing clams online or even in the store, refer to this Seafood Watch guide to see where your clams are coming from and if it’s safe for consumption. Clams will be low in fat, high in protein and will be high in selenium, iron, magnesium and niacin.